1.) 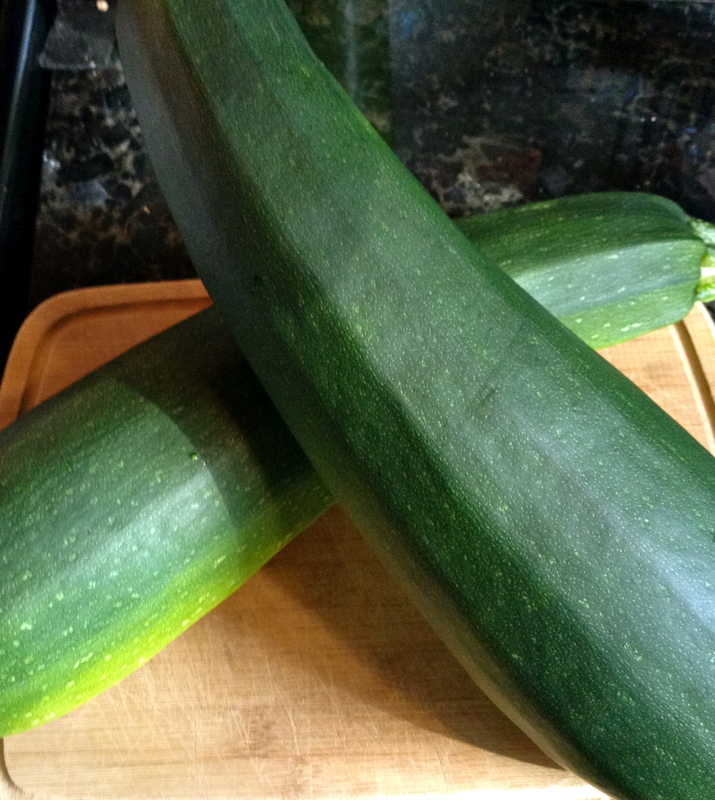 You first need one (or more) giant zucchini(s)…depending on how much you want to make…one big one made enough for four people…like heaping portions. 3.) Next, you need to make the noodles. 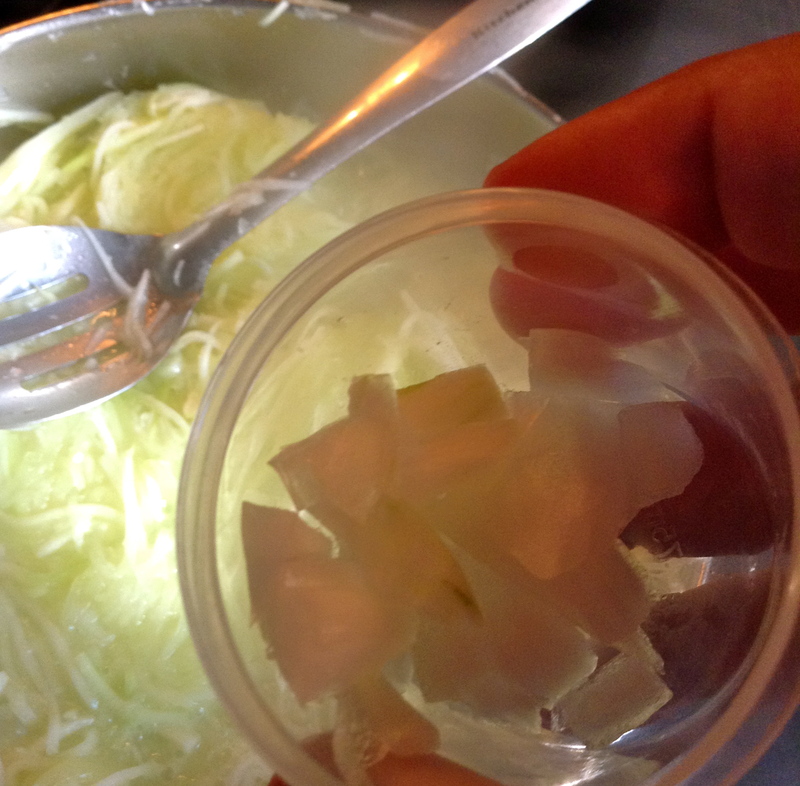 You’re basically going to cut the zucchini into small like strips that look like, alas, noodles. 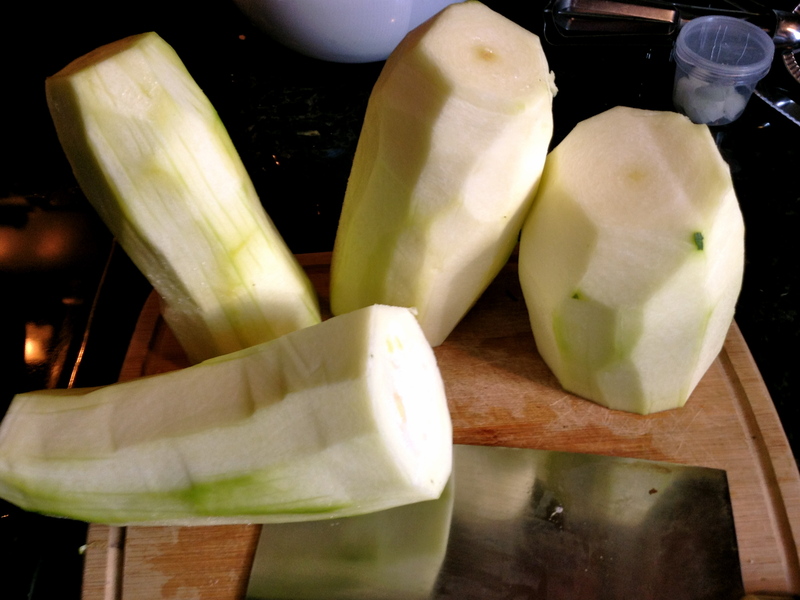 The best way to do this is by using a mandolin slicer as it saves you time and will uniformly cut the zucchini. 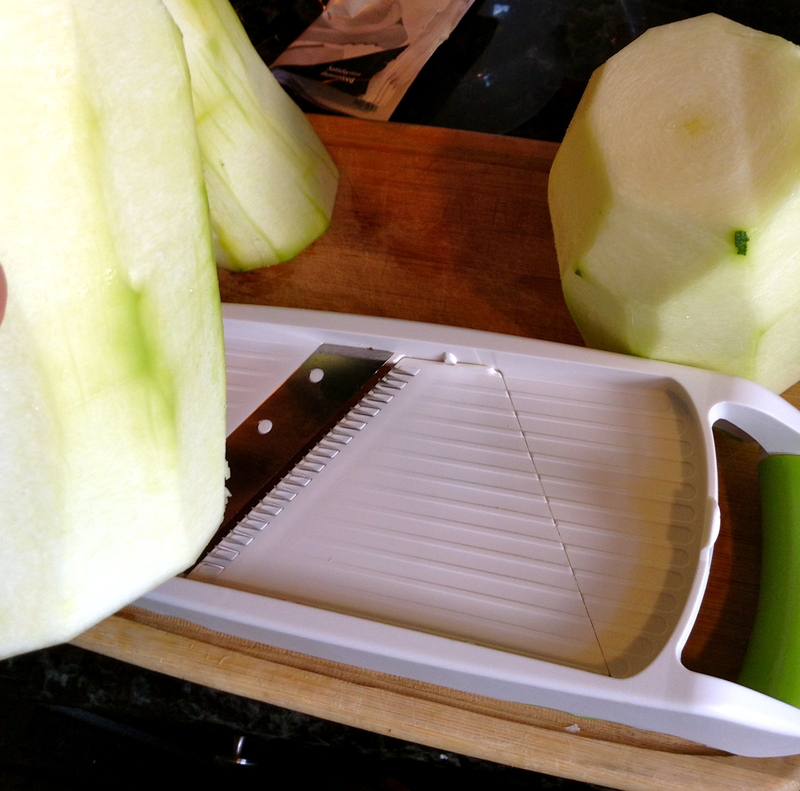 If you do not have a mandolin slicer, you can try cutting it by hand, but it might be annoying. 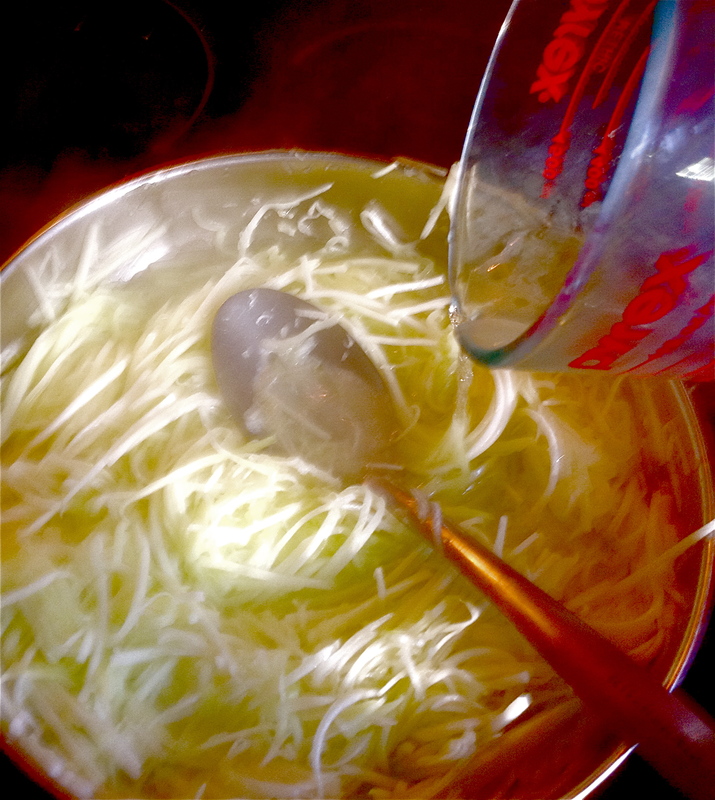 You could also use a vegetable peeler (although, when I did that, it made the noodles really thin). WARNING: Be wary of seeds, you do NOT want any seeds in your batch, so make sure you stop slicing before you reach the inner core of seeds. 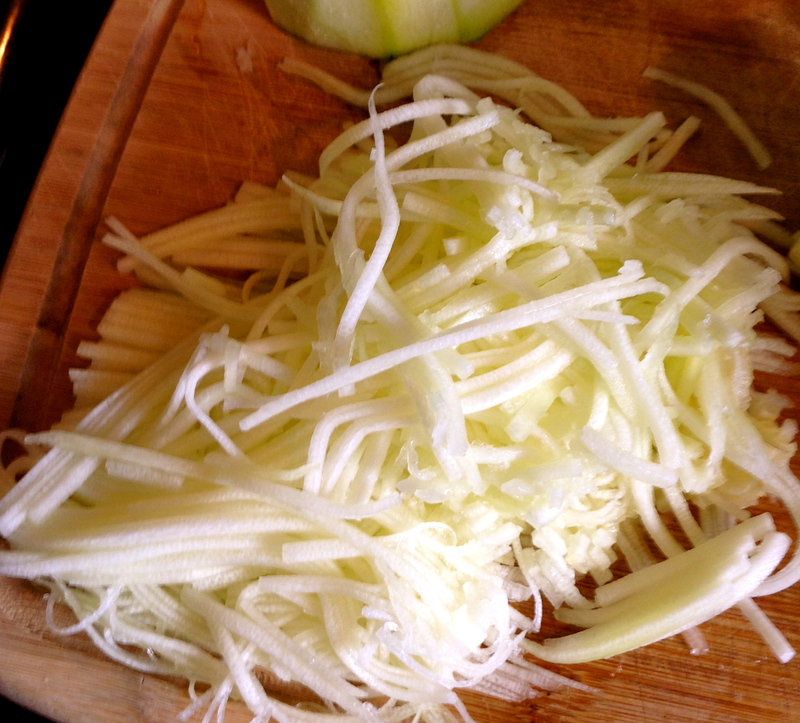 This is what the noodles look like when cut. 4.) Now you want to get a fry pan out and set it on high. Add some olive oil (EVOO for you Rachael Ray fans) or vegetable oil to coat the pan. 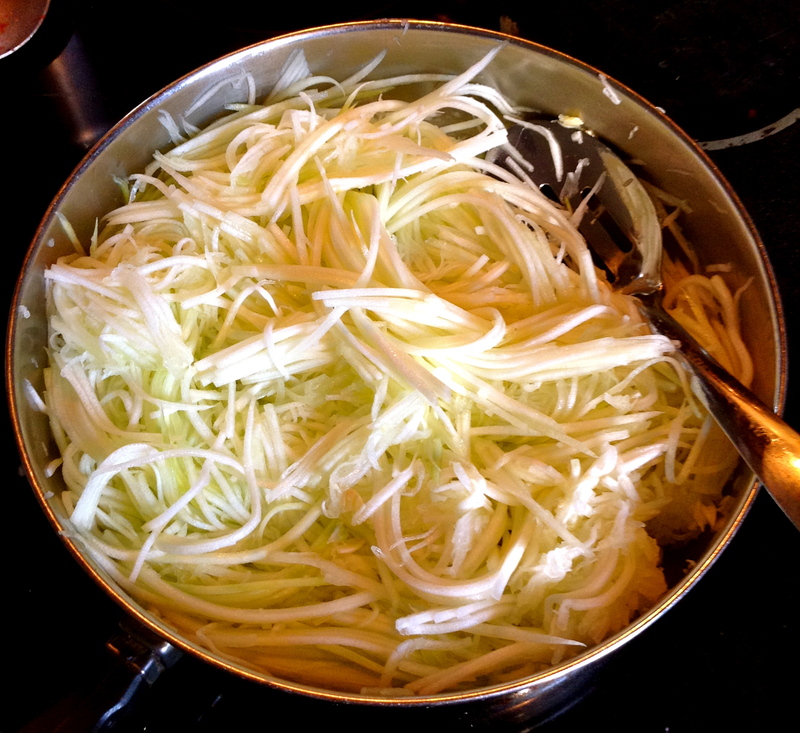 Then add your sliced zucchini noodles. 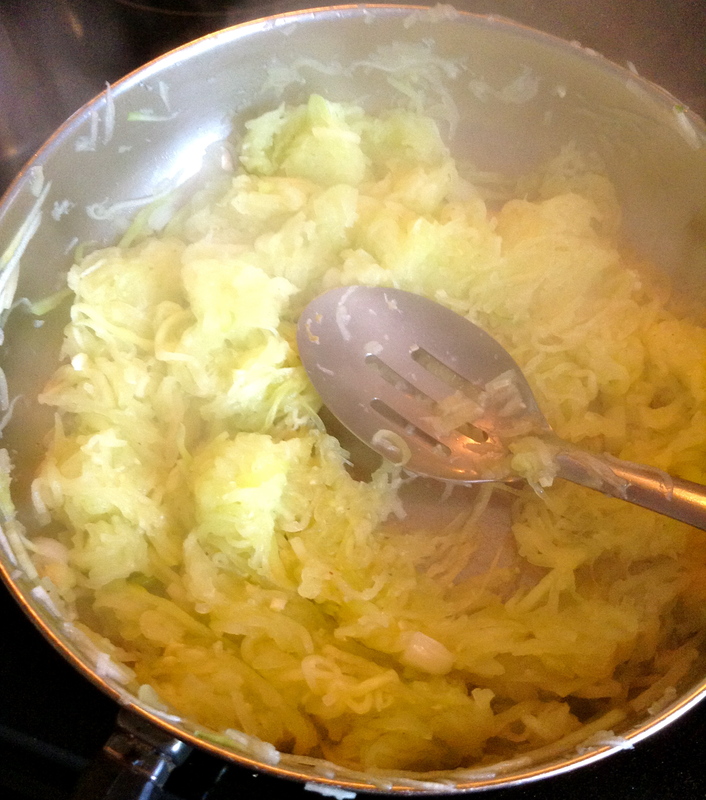 It will look like a lot, but, trust me, it will cook down (given that zucchini is mostly water). You don’t want to technically fry the zucchini, you just want to soften them. So, you should probably set it to a lower temperature if you arethe kind of cook who likes to wander whilst cooking. I, however, like to stand there and stir whatever is cooking, so I use high…it’s faster. You only want to do this for a couple of minutes…you don’t want to burn or brown it. 6.) The zoodles at this point are nice and soft, but rather tasteless. So now comes the step to spice them up. I added some onion, salt, pepper, and a little garlic. 7.) After letting the spices and zucchini cook and mellow out (I’d say it takes probably 5-10 minutes on high, but remember, don’t wander! Keep stirring! ), you’ll notice you still have a weird amount of water in the pan. It was at this point that I drained the pan…I mean, you have to drain regular noodles when their done cooking, right? 8.) 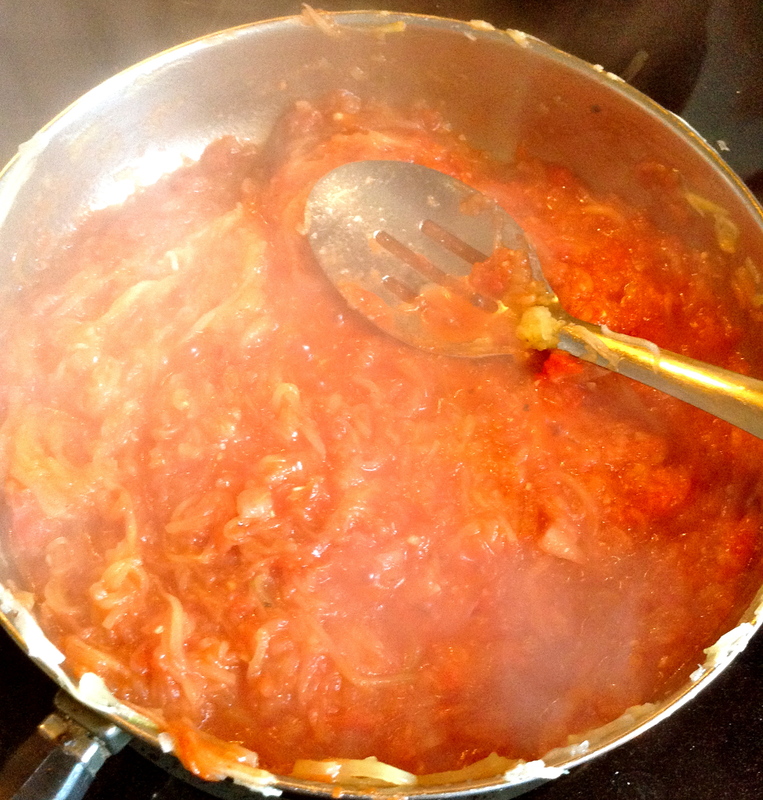 Finally, I decided to add some of my mom’s famous homemade tomato sauce (made from tomatoes from her garden…) (you can use regular tomato sauce, or whatever you use for your regular pasta), which really made this dish sing. I added about three ladlefuls, which is probably around a cup. Just add enough to cover the zoodles. Don’t forget to serve with some parmesan cheese! So, that’s it! I swear it’s not as disgusting as it looks, and you can’t even taste the zucchini. You feel like you’re eating some rich stew, but it’s just zucchini and tomato sauce (which basically is just tomatoes smashed up, right?). I’m thinking about playing around with this dish and maybe adding some potatoes or carrots and/or sausages to it. Or, perhaps, instead of using tomato sauce, adding in Alfredo sauce to make a sort of zucchini fettuccine…hey, why not, we have so much zucchini that it wouldn’t hurt to try!